McMorris Rodgers recounted sending a video to organizers of a women’s march in Spokane, Washington, who decided not to show it. [Tennessee Congresswoman Diane] Black said she was “affronted” seeing girls age 10 or 11, she guessed, holding signs with curse words and condoms and tampons taped on them when she attended the women’s march in Washington with her daughters last year. “That is not what I believe we should be teaching our young girls, to tell them that’s what makes them strong,” she said. But is there actually a conflict? Are Republican women elected officials and candidates truly in a predicament? White women after all form the base of the Republican Party—53 percent of white women voted for Donald Trump, and in last year’s special election for an open Senate seat in Alabama, 63 percent of white women cast their ballots for the noted sexual predator Roy Moore. Given this, it’s hard to believe that there’s any conflict at all. 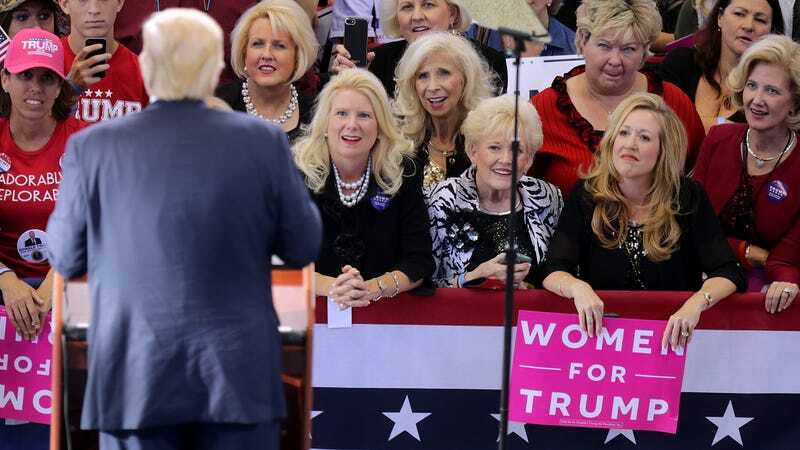 Maybe the real problem is that these women continue to align their interests with a political party and men who have shown an utter disregard for the lives of women, but it’s a bargain they’re willing to make in service of whiteness, reactionary judges, and regressive tax cuts. What a pickle.